If you're looking for a job in criminology or criminal justice, consider yourself forewarned: law enforcement careers may be hazardous to your health. It has long been believed that police work is correlated with a host of diseases, illnesses, and ailments. Hard research by Doctor John Violanti, professor of social and preventative medicine at the University of Buffalo School of Public Health and Health Professionals has confirmed this. The fact is, police officers are far more likely to suffer numerous health complications than members of the general workforce. There are two primary factors that have been identified as being associated with most of the health issues officers face: shift work and stress. Shift work is considered to be any hours worked outside of standard daylight hours, typically between 7:00 AM and 6:00 PM. Stress, of course, is understood to be a person's response to external stimuli, situations, and incidents, known as stressors. The bad news is, if there are two things law enforcement careers have plenty of, they are shift work and stress. This adds up to the potential for plenty of health problems down the road for police officers. According to the United States Department of Labor's Bureau of Labor Statistics, there are approximately 15 million Americans, or 9 percent of the total workforce, who work non-standard or irregular hours. By contrast, a majority of the police force is assigned to shift work, either rotating into and out of night shifts or working them permanently. So what's the problem with shift work? In a word, sleep. Everyone needs it, but not everyone gets it. Police officers are among those who get it the least. According to Doctor Claire Caruso and Doctor Roger Rosa, researchers at the National Institute for Occupational Safety and Health, people need sleep similarly to the way in which they need food and water. Sleep, as anyone who has ever been tired can attest, is a biological necessity. Healthy sleep is vital to maintaining life, overall health and workplace safety. When we are tired or fatigued, our ability to make decisions is diminished and our immune system is inhibited. We are also at a greater risk for mental and psychological ailments. Shift work affects sleep patterns for a variety of reasons. First of all, according to Dr. Caruso and Dr. Rosa, humans are hardwired to sleep when it's dark outside. Unfortunately, working during non standard hours necessarily requires sleeping during non standard hours. The problem is that working nights and sleeping days goes against our biology. It's unnatural for us to be up and working during the night, which contributes to a feeling of tiredness or even fatigue through a shift. Likewise, it's unnatural for us to sleep during daylight hours, making it harder to fall and stay asleep in the daytime. In addition to the biological issue that affects sleeping during the day, there are practical and logistical issues, as well. Officers who have families or who live with people working regular hours will often find their sleep interrupted by other people in the home, who are understandably awake when the officers are not. Even if they live alone, the ambient noise of normal daytime activities can impede daytime sleeping. Researchers from the University of Buffalo worked closely with the Buffalo Police Department to produce the Buffalo Cardio-Metabolic Occupational Police Stress (BCOPS) study, published in the International Journal of Emergency Mental Health. BCOPS suggests a strong link between police stress and poor health. The study was predicated on the belief that high demands are placed upon law enforcement, which would, in turn, lead to chronic health problems. It is widely understood that police officers face tremendous physical and psychological stress on a daily basis. Generally speaking, the encounters police officers have with the public are unpleasant ones; rarely are officers called to give someone good news. Officers are required to deal with numerous stress-inducing situations, including scenes of death and dismemberment, argumentative traffic violators, aggressive subjects, and miserable, upset, angry or depressed individuals. The BCOPS study draws a correlation between the daily stress of police work and obesity, suicide, sleeplessness, and cancer. It also confirmed the relationship between sleeplessness, shift work, and overall health, suggesting an increase in metabolic syndrome, which includes abdominal obesity, high blood pressure, type 2 diabetes and resistance to insulin and possible stroke. 40 percent of officers were obese as compared to 32 percent of the general population. 25 percent of officers demonstrated signs of metabolic syndrome compared to 18.7 percent of the general population. Officers faced an increased risk of Hodgkin's lymphoma and brain cancer after 30 years of service. Suicide rates were eight times higher among active duty law enforcement officers as opposed to those who had retired or resigned from the police force. Health hazards aside, society needs police officers. Someone has to do the job, and many of the stresses that come with it are unavoidable. It's well known that law enforcement careers are dangerous anyway, without poor health being taken into account. When working shift work, allow yourself enough time to get adequate sleep between shifts. Stay away from heavy foods and alcoholic beverages before going to sleep. Reduce your caffeine intake and stay away from caffeine and other stimulants for several hours before you try to sleep. Choose a quiet, dark, cool and comfortable place to sleep, especially if sleeping during nonstandard hours. Establish and maintain an exercise routine to reduce stress, improve personal health and help you sleep. If you find that you're having difficulty dealing with the stresses of the job or getting enough sleep, seek professional medical help as soon as possible. Why Work in Law Enforcement? With all of the stresses and potential health issues that come with the job, why would anyone choose to work in a law enforcement career? The fact is that with a positive, healthy outlook and good sleep and exercise habits, law enforcement careers can prove to be fun and rewarding. 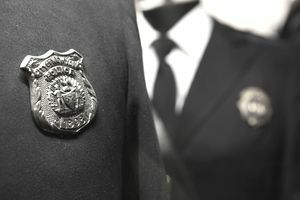 Police officer careers can offer plenty of benefits, both tangible and intangible, and are among the highest paying jobs in criminology and criminal justice. Of course, idealism and altruism also play a role. If you think you have what it takes, working as a police officer may just be the perfect criminology career for you.